It looks like another of the secrets is out. 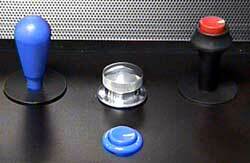 SlikStik previewed their new stainless steel joystick handles on the BYOAC forums this weekend. The entire thing is made out of a single piece of stainless steel, and it looks like it'll probably fit almost any existing joystick. I'll write a review as soon as I get a set, which should be within a week or two. It certainly looks fantastic, IMHO. Well, one of the secrets I've been sitting on is now out of the bag: SlikStik has announced their new DIYcabinets, which will be available soon. I'm getting the first unit off the assembly line (I'm going to be writing the installation/assembly manual for them), and I'll be sure and write up a review of it as soon as possible. I'm also going to be buying a Wells-Gardner D9200 arcade monitor to put in the new cab, so expect a review of that as well. As you can guess, this means that there is going to be a new “MAMEframe II” soon. I'm going to be selling off my “first-born” arcade cabinet to help pay for the new unit, so expect a complete overhaul of this site once the deal takes place. Okay, as promised, I've finished my review of MAMEngineer's Bezel and Marquee Printing Services. If you've been thinking of having your own custom artwork printed for your cab, check out my review. Sorry for the lack of updates, I've been fighting a really nasty cold the last week. I'm planning on writing my review of the marquee and bezel printing service from MAMEngineer this weekend. I'll be sure and post when it's finished. Update: I added prices and links for each of the spinners and knobs, and changed some of the row labels in the comparison chart to clarify exactly what I trying to measure. I also tried to clarify the criteria I used to score things. Oh, and I finally got my marquee and bezel from Tom B (MAMEngineer)! Unfortunately, I haven't had the time to mount the bezel yet because of the Spinner Review, but I'll do it this weekend. The bezel looks great, btw, and I'm hoping that it looks as great installed as it does currently sitting on my workbench. I'll post more photos and a review soon. Hopefully I can finish up the review in a day or so — I just underestimated how much there was to cover. With five spinners and four knobs, there are a lot of possible combinations to take into account! Oh, and one more thing — I finally heard from Tom B (MAMEngineer)! Seems my bezel and marquee are finally in the mail, and I should have them tomorrow or Tuesday. I'll post pics here once I've gotten them, then I suspect I'll have to have a “photo session” with the MAMEframe to show off its new look. Kelsey (of Oscar Controls fame) emailed me today, with some very nice pictures of the new Discs of Tron knob. He had them shipped to him before they were anodized black so he could check them out first, which will delay things just a bit. Personally, I think the knob looks very cool in the plain aluminum. I've add the two pictures of the knobs Kelsey sent me to my Oscar Up/Down Spinner Preview. With the changes in the schedule for the knob anodizing, it looks like it will probably be next week at the earliest before I get the DOT knob (and can then finish my Spinner Roundup and Oscar Up/Down Spinner review). In the meantime, I've decided to put up a short (13 seconds) video showing the Oscar Up/Down Spinner in action. Got an update from Kelsey (of Oscar Controls): the new DOT knobs have been machined, and are now being sent to be anodized. He should have them by the end of the week, which hopefully means I'll have one shortly thereafter. Not much news today, as it was Mother's Day weekend and, well, I took care of a lot of household things ;-) I should hear today about the Discs of Tron knob from Oscar Controls, and once I've gotten that I'll be uploading my spinner review and roundup articles. Still no word from MAMEngineer (Tom B) about my bezel and marquee, nearly a month after he said it was printed. He's not answering emails, either. IT'S HERE...the Oscar Controls Up/Down spinner, also known as the Discs of Tron spinner, has arrived. I've agreed to Kelsey's request not to do a full review until I get the matching Discs of Tron knob, but in the meantime I have posted my first impressions and some photos. In addition, I've finally been able to start work on my Spinner Roundup article, now that I have all the spinners in the roundup ready to go — check out the pages, as I'm going to keep putting up new pictures as I write the reviews. The new Tornado knobs arrived today. First impressions - they're really sharp. Literally. The knurling on the sides feels almost like a metal file. I'm sure it'll wear down with some use (and not my fingers instead! ), but if it doesn't I'll just dull it down with some fine sandpaper. The waiting continues, but I've got some good news to report: first, my new SlikStik Tornado spinner knobs will be here tomorrow, and Kelsey sent me a note that he will be shipping out the Oscar spinners for review (including the Discs of Tron spinner!) on Monday. As promised, I'll be sure and post my first impressions as soon as I get them, with a more detailed review shortly after that. I got a few requests for more detailed pictures of the Tornado assembly and how the knob mounts. The small black thing in the picture is the “set screw,” a small threaded plug with a Torx 10 female socket on one end and a pointed end on the other. 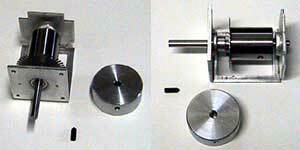 It threads into the holes on the sides of the knob (180° offset) and pushes against the shaft to hold it in place. Okay, SlikStik has officially put their new knobs on their web site, and I've ordered two of the skirted knobs (one polished aluminum and one anodized black), as I couldn't make up my mind as to which I wanted on the MAMEframe. I should hopefully have them in my hands within a few days, and I'll be sure and post my thoughts about them then. Kelsey at Oscar Controls dropped me a note (including this pic of the installed DOT spinner prototype) to say that things are still on schedule. He won't have the new DOT knob ready for me quite yet (another week or two), but the DOT spinner should be here soon. I'll post a short “preview” once it gets here. In other news, I thought I'd have my new bezel and marquee artwork by now — stranger yet, I haven't even been able to get ahold of Tom B (MAMEngineer) at all. More Knob Knews! SlikStik keeps feeding me tidbits on their new knobs: they've added black and green colors, and announced the pricing: the new skirted knob is $1 more than the standard knob ($17.95) and adding any of the colors is free. Orange and yellow colors may be added soon, as well, but personally, I'm already drooling over the black skirted knob. The knobs should be available next week. In other Knob Knews, Kelsey at Oscar Controls assured me that he should be able to get his new Discs of Tron spinner out to me for review by next week. I don't know if he'll be shipping it with his new Discs of Tron knob or knot (okay, enknough! ;-) but I'll try and find out. I believe he's going to make it available in anodized black, as well, so I'm definitely going to be a happy camper with either spinner knob! Got the dimensions on the new SlikStik knob: the skirt section is 1 3/4" dia., and the knurled “grip” area is 1 3/8" dia. Sounds just about right for Tempest gameplay, and I should have a “review knob” in my hands within a week to test out. Still no word on pricing. 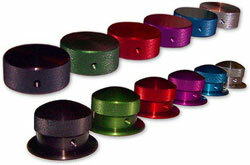 Another email from SlikStik with yet another neat picture, this time of their new anodized colors for their spinner knobs. According to the note, they are going to be producing knobs in blue, red, and purple. The pictures of the knobs look great. No word on when they'll be available, but I suspect sooner rather than later. I'll see if I can get some more details, including the dimensions of the new knob design. 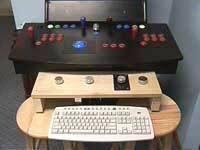 It'll looking more and more like this will be a very good year for arcade spinners! Got news that Tom has printed my new bezel and marquee, and they should be here in a couple of days. I'll be sure and post pictures once they're installed. Oh, and if you're curious, I've finally put a picture of myself up on the Contact page. I just got a very, very interesting picture in my email from Christian at SlikStik. 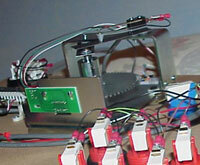 He mentions that the knob is milled from solid aluminum. No details yet on price, dimensions, or when it will be available, but it sure looks like it'll be a fantastic knob for Tempest players. Here's something neat: A “universal” bezel for vertical games that “fills in” the unused sides of the screen with the MAME logo. It uses a custom artwork file by Triggerfin (of Catlist fame) and a batch file by Marcus Tiller that duplicates the artwork for all vertical MAME games. I've put all the files together for downloading (except for the PKZIP program, which can be downloaded here).